In 1933, Rockefeller Hall was built by the National Park Service in Acadia National Park in Maine. 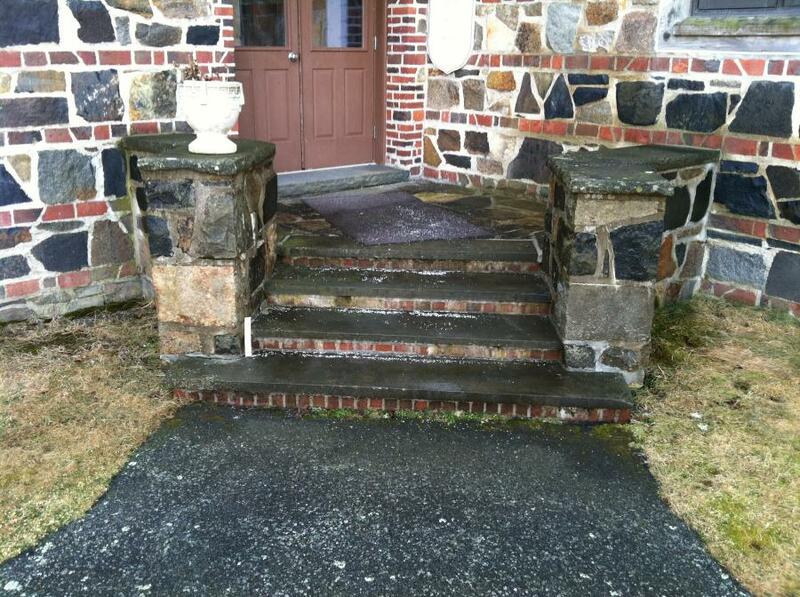 The style is a neo-French Provincial and features seven unprotected stone entrances, all with stairs and landings. Such structures may fare well in the French Provinces, with whatever the weather is that they get, but along the Maine coast, the freeze thaw cycle can be depended upon to penetrate and destabilize horizontal planes on heavily mortared masonry structures. And so it was for the entrances at Rockefeller Hall. All masonry had to be disassembled to sound substrate, virtually completely. Hascall and Hall of Portland, ME were the masons selected to do the work. Side entrance, after. Typical finished work. 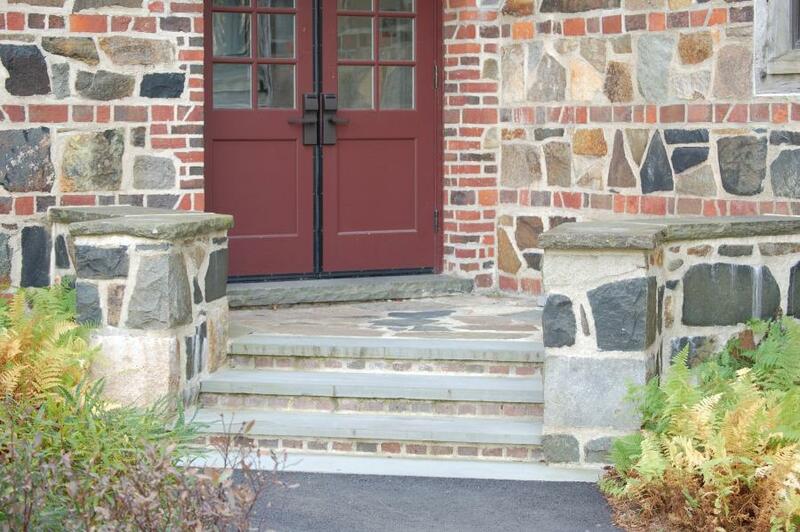 These entrances are constructed of several materials, rough stone for the walls and paving, finished stone for the stair treads, brick for the risers and cast concrete for the parapet caps. Back in 1933, this was straightforward enough for the masons to build, working from the architect’s drawings. Where the mason was moved to put a given stone, there it remained, for the next eighty years or so. Things were not so simple for the restoration, however, as the expectation was that the restoration would replicate the original work, with no stray stones left over. Hascall and Hall achieved this with extensive documentation, before disassembly. Each entrance was photographed from multiple angles and each masonry unit numbered, with its orientation noted, in order to assure that each stone could be returned to its original position. Front entrance. Original conditions, note mortar joints and unstable masonry units. 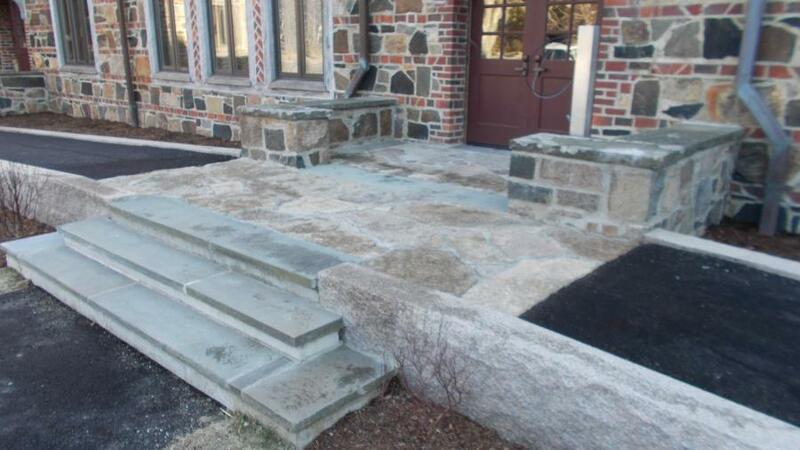 Front entrance, after, accessibility upgrade. 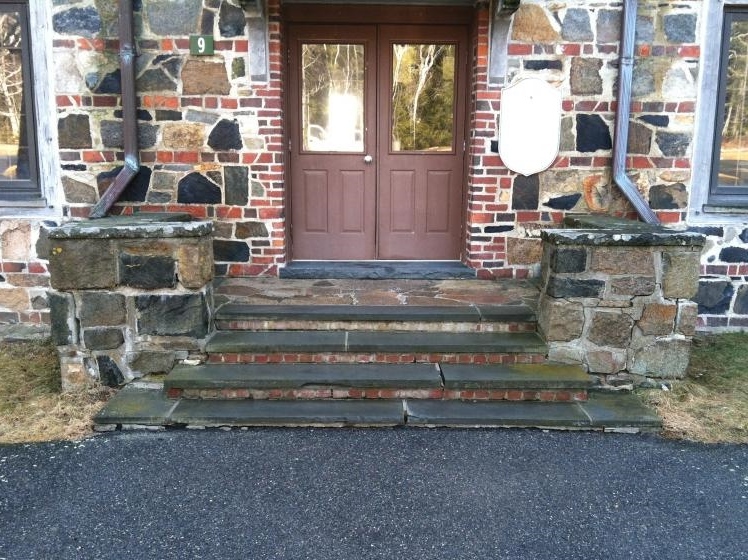 This entry was posted in Stonework and tagged Maine. Bookmark the permalink.